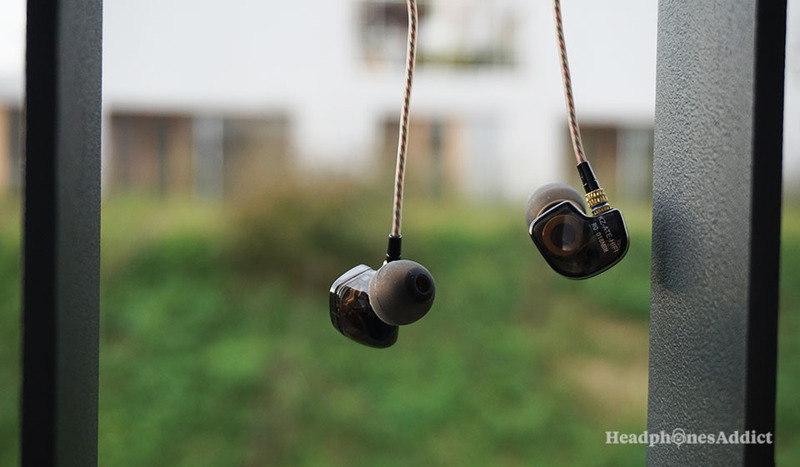 KZ ATE Review – Are the Chinese Earbuds Worth the Hype? 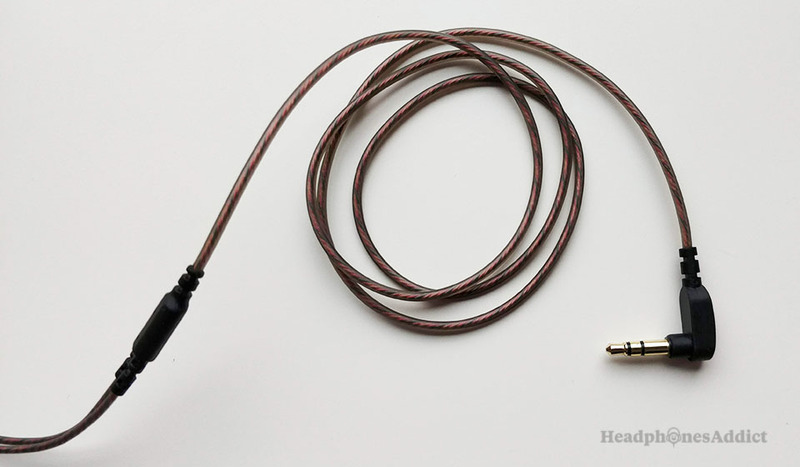 One of the most popular in-ear headphones for a basshead on a budget. Are they actually worth the price? Note: We bought the headphones (in-ear monitors) ourselves, we heard great things about them, and this is our review. KZ ATE are one of the cheapest in-ear headphones on the market yet deliver a lot of value to the right user. There are plenty of people looking for dirt-cheap earbuds with powerful bass, and these are the answer. So in case, you’re a basshead… And a stingy one, you should check these out. Please take a look at it and let us know what you think. The KZ ATE in-ear monitors demand behind-the-ear fit. The package is as basic as they come. The moment you take the in-ear monitors out of the box you realize they’re lightweight. But when you want to put them in the ears, you get confused. Putting them in is not straightforward from the start. Now, there are markings for the correct side on each bud but what confuses is how exactly they fit into an ear. It’s an over the ear fit, and it’s a bit unusual. You have to “play” with it to learn how to do it properly. Even then, the IEMs feel a bit different, yet when you get used to the fit, they are quite comfortable. The earbuds are lightweight but have less than ideal ergonomics. Now overall, these don’t have great comfort—the plastic casing touches your earlobes funny— but stick into ears well and don’t fall out. It will probably take you a while to get used to them, but once you do, you’ll use them just like any other earbuds. Moreover, the foam tips—already attached—are unobtrusive and create a good seal. In case you have bigger ears you’ll need the large size tips for an airtight fit. Unfortunately, these come in silicone type only. 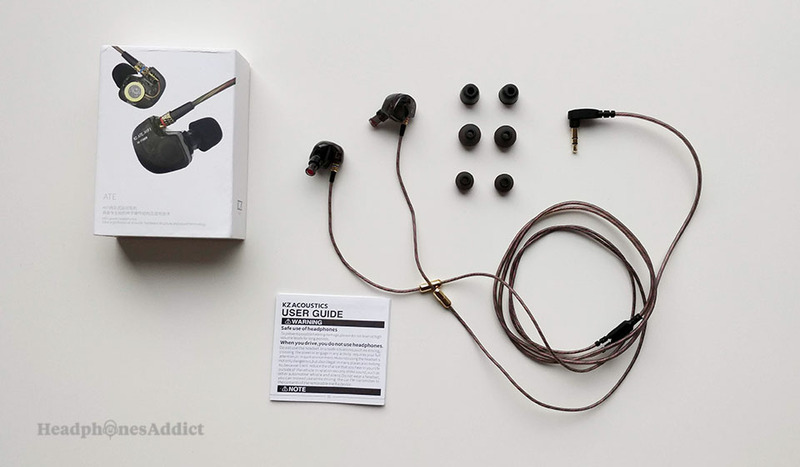 When it comes to passive noise isolation, the KZ ATE in-ear headphones do a good job. Due to closed-back design and in-ear fit, they are effective at blocking ambient noise around you. Keep in mind you need to use proper fitting eartips. Otherwise, the earphones will leak sound and have no bass. Overall, the noise isolation can be rated as above average though you can find better isolating earbuds on the market. Additionally, they produce a bit of cable noise from the wire divider up. The rubbery wires create sound if they’re hitting against your clothes. The cable noise is present however, it isn’t too bothersome. It becomes a non-issue if you’re sitting or listening to higher volumes. The weights in the wires play an important role. 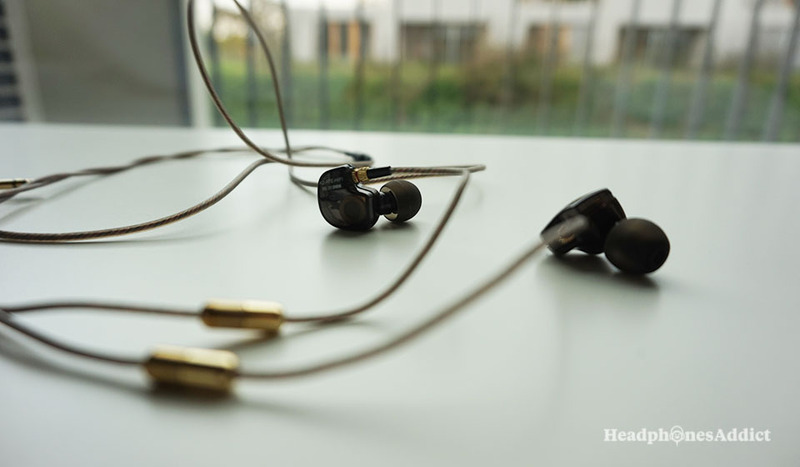 Since KZ ATE are low-priced earbuds, you can’t expect too much from build-quality. The casing is entirely plastic—see-through plastic—and is glued together with 2 parts. There’s no sweat protection even though it says “HIFI sports headphones” on the box. The cables are protected by tangle-free rubber. Tangle-free doesn’t mean they don’t want to coil (they do) but that it’s much easier to untangle when needed. Even so, the wire protection is better than what you’ll get from competitive in-ear headphones at this price range. 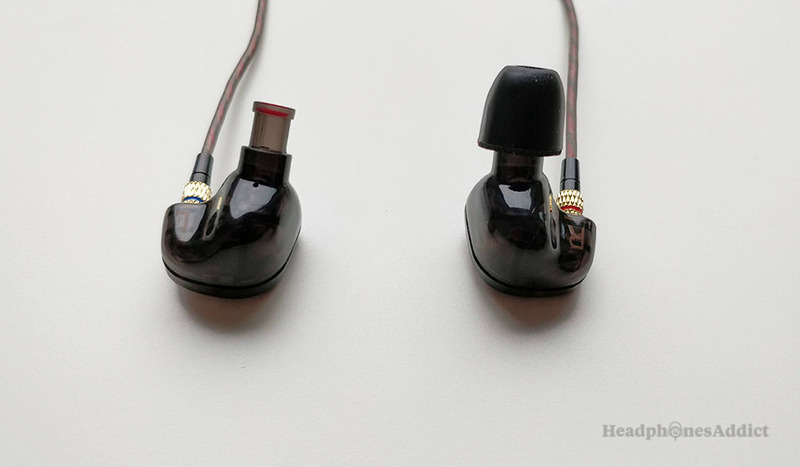 Additionally, weak points like the earbud joints and the 3.5mm L-plug are reinforced. The joints are supported by metal “screws” that make them look more expensive than they actually are. The 3.5mm plug is covered by black, rubbery material for extra flexibility. 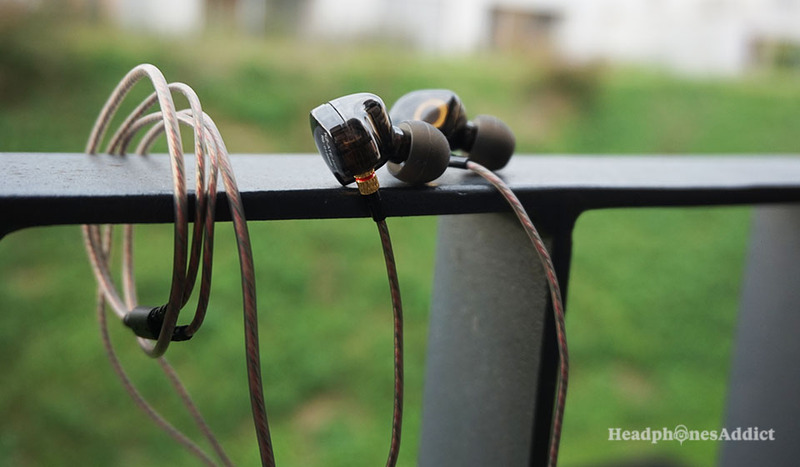 In the end, the KZ ATE aren’t built like a tank, but for budget earbuds, they have better durability than most in the category. The 3.5mm plug is L-shaped and reinforced with plastics. First of all, you should know there are 2 models. One frills-free model without the microphone and remote control which costs a bit less (couple dollars less). And a model with an in-line microphone and 1-button remote control that’s a bit more “pricey.” Both cost around $10. The IEMs are precisely the same and have the same sound the only difference is the addition of mic and remote. You can get either one. If you use the earphones with your smartphone, you might as well get the microphone version since the price difference is negligible. Anyway, if you get the microphone, you should know it’s of decent quality. It works on iPhone and Android phones. Not for noisy office use but you can have a normal conversation in a quieter environment. Also, the 1 button remote controls; play/pause, skip a song, answer/hang up a call and call the last number. However, there is no volume control since it has only 1 button. 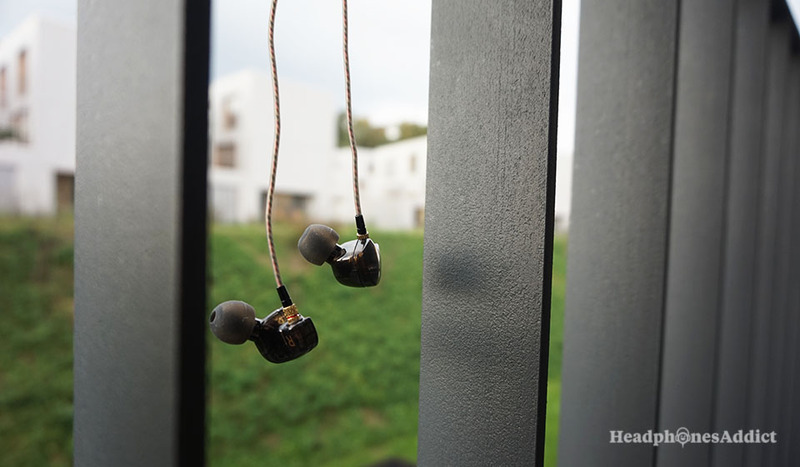 Audio quality is the main advantage of the KZ ATE that all the audiophiles are raving about. And it’s true. They could’ve easily charged $30-$40 for these. The sound signature is typical bass-emphasized but not overly overpowering, so you can still hear the details of mids and highs. The focus is always the lows. They’re punchy and have a surprising amount of detail. If you’re expecting overpowering, muddy bass that smashes all other tones, you’ll be disappointed. The enhanced bass response doesn’t take away from mid and high range which is a good thing. The earbuds can get quite loud as well without sacrificing sound quality. Bass response is extended yet controlled. Nonetheless, they aren’t perfect, and when you crank up the volume, you get a slightly violent treble (harsh and a bit sibilant). Thankfully it doesn’t suffer from this problem at normal, healthy volumes—which you should be using anyway—so it’s not such a huge issue. The highs themselves are able to reproduce quite a lot of detail and clarity so you can easily listen to calmer music and enjoy it. Also, the soundstage seems to be better than what the around $10 price tag would suggest. It’s not phenomenal, but you’ll detect audio position better than with your average cheap earbuds. Overall, they are an excellent choice for a basshead on a budget and surely deserve the hype in the audiophile (cheapskate) community. While they are clearly budget earbuds, they perform better than most competition. The KZ ATE are without a doubt one of the best cheap earbuds at the moment. With an unbeatable price of around $10, solid comfort and build-quality and a basshead-friendly sound they’re a real bargain. If you like bass and don’t mind spending a “sawbuck” on new earbuds, get them here. Please comment and let us know about your experience with these in-ear monitors.